View Pronghorn hunting regulations for your county. For all pronghorn harvested in Texas, a permit must be properly and completely filled out and attached anywhere on the pronghorn. 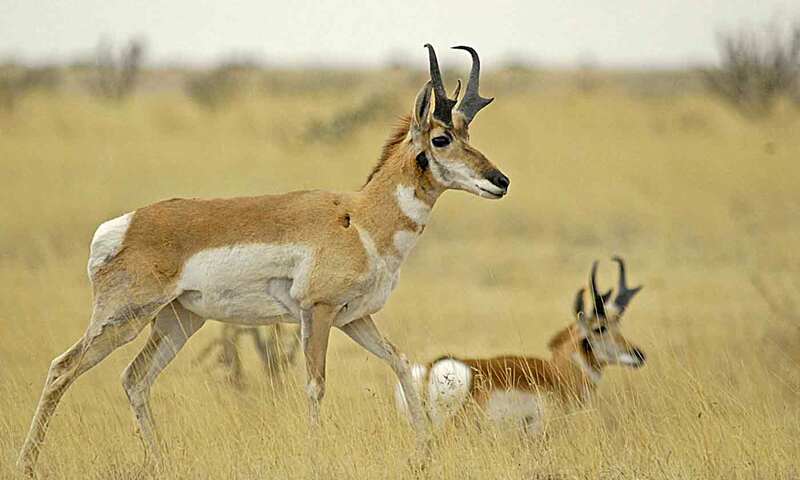 Pronghorn permits are issued to the landowner or landowner’s agent in most areas where there is an open season for pronghorn (the Trans-Pecos, Permian Basin and Panhandle); however, the department is testing an experimental, buck-only season in selected areas of the Panhandle. On properties within the experimental areas, hunters must obtain a FREE Experimental Pronghorn permit directly from the department or a participating local merchant, not from the landowner. Hunters must still obtain landowner consent to hunt (killing a pronghorn without landowner consent is a felony, see Hunting Laws, Penalties & Restitution for unlawful activities). Additionally, hunters must present the entire head (intact) of any harvested pronghorn at a designated check station within 24 hours of take. For more information on the experimental buck-only season in the Panhandle, including maps of the areas, locations where permits may be obtained, and locations of mandatory check stations, call (800) 792-1112, or see FAQs about pronghorn permits.